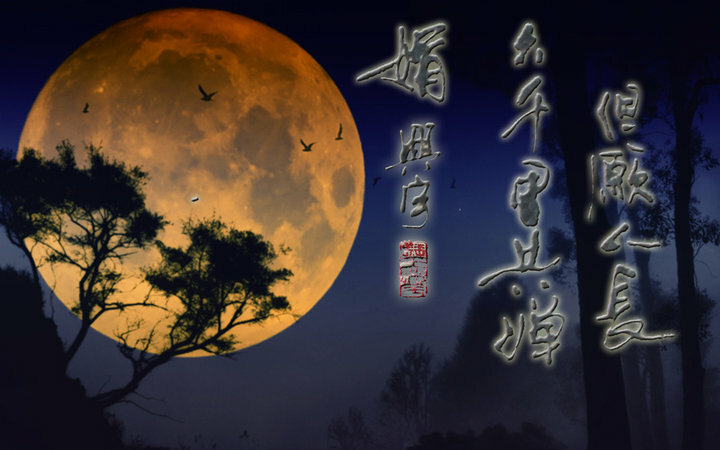 Today is the traditional Mid-Autumn Festival. It is a harvest festival celebrated, as family members gather, loved ones joyously come to the reunion. In the eve of one particular Mid-Autumn Festival, Su Shi (January 8, 1037 – August 24, 1101) , one of the most celebrated in the history of China, a writer, poet, artist, calligrapher, pharmacologist, and statesman of the Song Dynasty, missing his beloved brother far away, wrote this quintessential poem that became a standard recital piece for this particular holiday. Thinking my folks, and all the people who miss their loved ones, I picked up my rarely used brush this morning. I too wish may those who love be blessed with amour and life that last. “In this light and on this evening”, we shall celebrate the moon. It is my prayer that families with their loved ones being away, particularly those of the servicemen and women, shall be living apart together in the spirit of love, that their emotions and sentiments shall be brought to a joyous reunion by the glory of the full moon, when it is shared by, close from afar, the millions. when do you decide to be full? I submit my wonder towards the sky. what would be their season tonight? yet I am fearful it would be utterly cold. I’m afraid it won’t feel like home. the moonlight glazes over the sleepless person. when loved ones are to part? they part and may come in reunion. waxing and waning she goes through. since the very olden days. Though they might be far away apart.